Joining the Ford Foundation in 1997 as a senior grants administrator was a dream come true for me, a nonprofit finance and administration maven and budding social justice organizer. I had high hopes and expectations of the possibilities in philanthropy, the other side of the woes and struggles of meeting payroll obligations and preparing for the next community board meeting or fundraising priority. And Ford did not let me down. I was overjoyed to trade struggling nonprofit problems for the pressures of reaching payout targets and prepping for internal officers’, global and trustees’ meetings, because I knew that all those mundane but critical efforts were helping marginalized folks across the globe. I pinched myself whenever I had the opportunity to travel to one of the overseas offices to train and be trained. I was most especially in awe of the rock-star women leaders I had right in front of me, Natalia Kanem and Susan Berresford, to name two. I marveled at the varied ways they wielded power, insured impact and embodied compassion like I’d never seen before. Yes, the men in my corner of the Foundation were also legends, but those women heroes, and others as well, unbeknown to them, were my guideposts for pursuing the audacious. During my years at Ford, I was soaking in and applying lessons learned there to my local suburban community, Summit, N.J., where, as a young African American working mother I could have easily been invisible, except for my tenacious community service and the powerful name of the Ford Foundation, which I leveraged handily. I took great delight in what I called using prestige and privilege for good. I took every annual report message from SVB, as we fondly referred to Susan, as a personal goal. I shared reproductive rights reports from the south with my influential pastor, who was spearheading ministries in South Africa and Kenya. I recommended nationally recognized educational equity experts who were referenced in Foundation reports to consult with the Board of Education that I served on regarding the minority achievement gap. 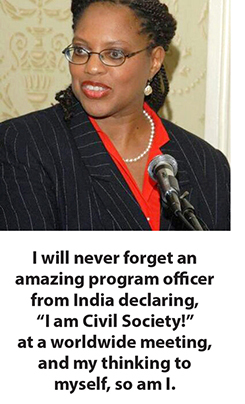 I will never forget an amazing program officer from India declaring, “I am Civil Society!” at a worldwide meeting, and my thinking to myself, so am I. Now, all LAFF members know the hallowed walls of philanthropy are no place for the faint of heart. Being under the microscope of so many critics comes with the territory. And Ford is no exception. In fact, it’s often the target. I recall clearly the antagonism that showed up in a big way when the Gates Foundation and others alike arrived on the philanthropic scene in 1999 full of criticisms, better ideas and the ever popular model that demanded more measurement and a faster pace. I was bewildered at the time about the pressure being mounted on Ford as the object of wrath from “new philanthropy”, especially since they were regularly showing up at our doorstep to find out how we did everything. Currently, there are discussions under way about the challenges of power, privilege and philanthropy. Edgar Villanueva’s The Decolonization of Wealth and Annan Giridharasdas’ Winners Take All are eloquent critiques of the contradictions and mixed motives of wealth, charity, justice, generosity and privilege. As I read them with interest, skepticism and validation, I vividly recall the feeling of unsafe space inside and out of Ford that I attributed to working in an elite institution. I know, beyond a shadow of a doubt, that learning to navigate in that type of environment developed my keen ear for listening to the unsaid and developing a strategic road map for accomplishing the unexpected. And, grants management in particular helped me pay attention to the minute details on how working among actors, constituents and rule makers is an essential ingredient in stewarding lions, tigers and bears, my side gig known as politics. I can now say with clarity that the successes and, more so, the bumps in the road that I met with in each role of greater responsibility at Ford—a global manager in 2002 and, eventually, a department director in 2012—ran parallel with political achievements that were pioneering and even astonishing to me upon examination. My becoming Board of Education president, running for city council, losing that election but soon thereafter being elected chair of Summit’s Democratic party, twice, where I oversaw unprecedented growth and electoral wins, engagement with the county and state, and even being elected a delegate to the 2016 national convention—all this occurred separate from but alongside and with the full support of the Foundation. The common denominator that I can point to is that in philanthropy, and specifically in grants management, I learned to get things done behind the scenes and with a focus on the outcomes for people. That formula has worked similarly in leading party politics, where my magic wand has been used to build infrastructure with a focus on the people while keeping my eye on the prize, which is inclusive and effective democracy. A blue women’s wave has been the icing on my cake. While the wild wild west of politics seemed to suit me well when I retired from the Foundation at the end of 2016, with the expectation of either getting involved at the national level or returning to my nonprofit roots in a leadership capacity, I’ve yet to embark on either course but have returned to the ivory tower of philanthropy, establishing best practices and gaining new muscles for more civic engagement. I have, however, retired from local politics, happily turning over the proverbial chairman’s gavel in January to an energized cohort of progressive political warriors who are up to the challenges that lie ahead. As for me, I look forward to my next audacious adventures on the horizon. Susan Hairston, who was director of the Office of Program Operations and Services when she left the Ford Foundation in 2016, now is director of the JPB Foundation. Susan - What a wonderful essay and a great chance to catch up on all that you've been to. Keep up those audacious adventures!